Bob Dylan, Nobel laureate. 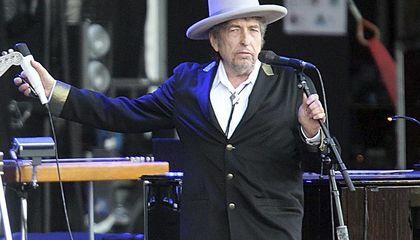 In the book world's equivalent of a Supreme Court ruling, the Nobel judges have declared that Dylan is not just a rock star, but also a poet of the very highest order. It is the ultimate ascension for the man who set off a lasting debate over whether lyrics, especially rock lyrics, can be regarded as art. Dylan, who gave the world "Like a Rolling Stone," ''Blowin' in the Wind" and dozens of other standards, now finds himself on a list that includes Samuel Beckett, Toni Morrison and T.S. Eliot, whom Dylan referred to in his epic song "Desolation Row." 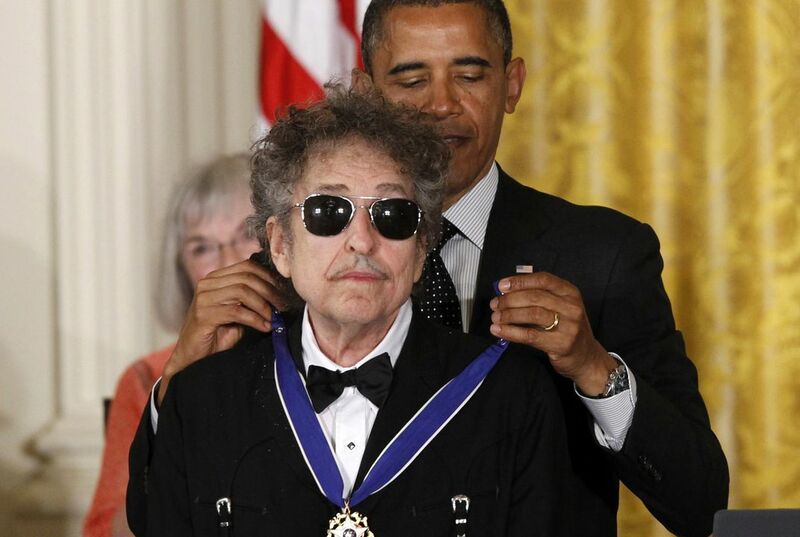 "Congratulations to one of my favorite poets, Bob Dylan, on a well-deserved Nobel," tweeted President Barack Obama, who in 2012 presented the singer-songwriter with a Presidential Medal of Freedom. Many music fans already quote Dylan as if he were Shakespeare, and judges work Dylan quotations into their legal opinions all the time, such as "The times they are a-changing" and "You don't need a weatherman to know which way the wind blows." "An ill-conceived nostalgia award wrenched from the rancid prostates of senile, gibbering hippies," wrote "Trainspotting" novelist Irvine Welsh. "I totally get the Nobel committee," tweeted author Gary Shteyngart. "Reading books is hard." The Vatican newspaper L'Osservatore Romano said it was too bad that a "real" writer didn't get the award. Nobel laureate Toni Morrison said in a statement that she was pleased and that Dylan was "an impressive choice." Salman Rushdie, who has written songs with U2's Bono, tweeted that Dylan is "the brilliant inheritor of the bardic tradition. Great choice." Perennial Nobel candidate Joyce Carol Oates tweeted that "his haunting music & lyrics have always seemed, in the deepest sense, literary." "Bob Dylan receiving the Nobel Prize in literature acknowledges the importance of literature's oral tradition, and the fact that literature and poetry exists in culture in multiple modes," executive director Jennifer Benka said in a statement. Dylan already was the only rock star to receive a Pulitzer Prize (an honorary one), and is, in fact, an author, too. He was nominated for a National Book Critics Circle prize for his memoir, "Chronicles: Volume One." I always liked Bob Dylan. He was a bad singer but a good song writer. I'm glad he got the Nobel prize. Bob Dylan struck a chord in the music industry, literally and figuratively, and his prize is well deserved. Music is considered art, and a part of that are is the poetic-literature aspect of the lyrics. When writing lyrics, musicians can use the same figurative language skills to form lines of songs the same way writers do. Dylan's lyrics are amazing and speak to you through literary quotes or rhymes. They are considered literature because his songs use big vocabulary word and uses word that were use in the past. They were considered literature because they way he wrote them. They were all mostly written as poems. His lyrics are written in a literature form. Bob Dylan's lyrics are considered "literature" because they are written like poetry but preformed like a song. Dylan's work is not just lyrics but verses in the bible as the passage above says. They're considered literature because he is a high ordered poet. The reason for that being is because he uses lyrics that were made famous by poetry writers. That is the reason that his lyrics are considered "literature".